The Osprey (Pandion haliaetus) is a fish-eating hawk found along coastlines and around marshes, lakes, and rivers almost worldwide. Ospreys are often seen flying over water searching for prey, then hovering and plunging feet first to capture a fish in their talons (fish are normally carried head first and belly down). Bald Eagles may sometimes chase them and force them to drop their catch. During migration, Ospreys may be seen far from water, even over deserts. Migrants travel singly, not in flocks. 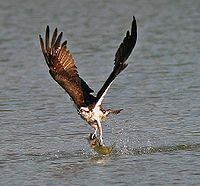 The Osprey's diet consists almost entirely of fish, generally in the range of 10 to 30 inch in length. Rarely, small mammals, birds, or reptiles may be eaten. The NFL team, Seattle Seahawks has an osprey for its mascot and logo. Other than that, ospreys are not a very common animal portrayed in the media and culture. This page was last modified on 5 May 2017, at 09:46.